MOLANDS The hot weather saw the fish spawning at the end of the week, but this seem to improve the fishing with match weights to over 70lb at the weekend. The pellet feeder or method feeder fished to the island is the winning tactic for carp to 10lb and F1’s with expander pellet, white boilies or meat on the hook. Paste or chopped worm and caster down the edge are also starting to work again. Best pegs are 2, 19 – 25, 29 – 31, 39 – 45 and 54 – 58. GEARYS Weights to over 80lb in matches and pleasure anglers reporting to 100lb+. Straight lead or pellet has accounted for the bigger nets of carp with fish to over 17lb falling to this tactic. The skimmers are also showing better all around the pool with fish to 2½lb in nets to over 40lb on pole and pellet or paste. Best pegs are 1, 7 – 12, 19 – 23, 27, 31 – 33 and 36. LITTLE GEARYS Fishing very well all around the pool with mainly F1’s and skimmers making up most of the catches but a few carp to 8lb also coming out. Fishing down the edge is working well with pellet, paste or caster all providing nets to 60lb. A small method fished to the island is also another top tactic. GRATUITIES In excellent form this week with some cracking nets of tench, small carp and skimmers being caught on every peg. Pole with 4mm expander pellet over micros has been the most popular tactic with a small method feeder to the island also catching well. The hot pegs are 1, 8, 9, 11 and 15. ANNIVERSARIES This pool has been very popular this week with mixed nets being caught all around the lake. Carp to 3lb, tench to 4lb, skimmers, crucians and roach all feeding well this week with pellet or corn the top baits. SIBLINGS Another pool in terrific form at the moment with crucians and skimmers in catches to over 60lb. Pole fished pellet is the top tactic but corn or meat are also worth trying for the bigger bonus tench or carp. 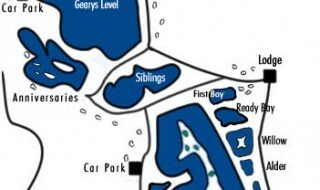 Best areas are the two points around the middle of the pool or the reed beds at the top end. WILLOW The reed beds on 5 and 6 are producing the bigger catches with carp to 5lb, F1’s and tench showing on these pegs to pole and pellet. Around the pool, there have been lots of skimmers, crucians and tench being caught on pellet or caster. Draw 9am, fish 10am to 3pm. Draw at 5pm, fish 6pm to 9pm. 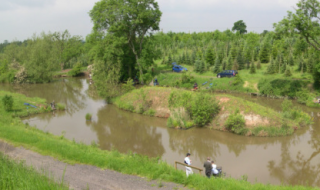 There are a limited number of places available on our Broadwater and Burnet Iron Syndicate waters. Carp to over 30lb have been caught this week on Broadwater. Anybody interested can arrange a viewing by telephoning the main lodge on 01676 522754.